Provides four refills for the 10.5 oz Refillable Moisture Absorber. Attract and trap excess moisture from the air to eliminate stale musty odors. Leaves behind a pleasant lavender vanilla scent. 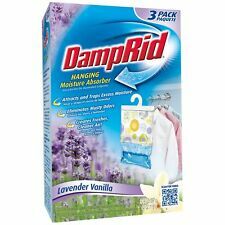 New Fragrance Free Hanging Moisture Absorber damp Rid Fg80ff 14 oz. The DampRidￂﾮ Hanging Moisture Absorber (FG80LV) is designed to hang in closets and enclosed spaces to protect items from excess moisture that casues damage. It lasts up to 60 days depending on temperature and conditions. So effective it's patented. RV AND CAMPING DAMP RID MOISTURE ELIMINATOR!!!! Attract and trap excess moisture to eliminate musty odors. Protect items from moisture damage in small spaces. Hang anywhere humidity is a Problem - closets, laundry rooms, bathrooms and more. Also available in fragrancefree and fresh scent. Hanging Moisture Absorber Lavender Vanilla 14 oz. (FG80LV). The completely natural way to absorb moisture in closets and other enclosed spaces, this hanging bag creates fresh, clean air and leaving behind a subtle hint of lavender and vanilla scent - while protecting against musty odors and damage caused by excess moisture in the air. You never have to worry about spills, thanks to its unique, patented design - you just hang it up and it works on its own. Each hanging bag will absorb moisture for up to 60 days depending on temperature and conditions. When all the crystals in the hanging moisture absorber have dissolved, you just toss it in the trash and Replace it with a new one. 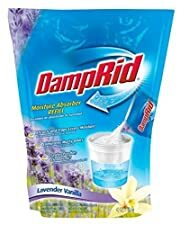 In addition to clothes closets, Damp Rid hanging moisture Absorbers are the perfect solution for: bathrooms, laundry rooms, storage closets, basements, garages, gym lockers, boats - or wherever stagnant, humid air is a problem. It is non-toxic, septic safe, and friendly to the environment. 4 refill bads to 1 box. 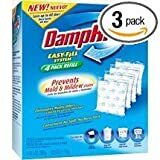 Damp Rid FG92 DampRid System Refill Pack - 3 Packs of 4 Pads WARNING: This product can expose you to chemicals which is [are] known to the State of California to cause cancer and birth defects or other reproductive harm. For more information go to www.P65Warnings.ca.gov.